Welcome to Four Points! 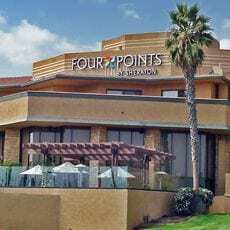 With easy access to downtown Ventura, Ventura Harbor and Oxnard, Four Points Sheraton is the perfect home base for your next Ventura County adventure! Dine for breakfast, lunch, and dinner at Alexander’s Restaurant famous for its Champagne Sunday Brunch. Stays at the Four Points by Sheraton include access to the following: Exercise Room/Facilities; Outdoor Heated Pool; Outdoor Whirlpool; Bicycle Rentals; Water Sports; Fresh Produce, Golf Courses, and the Channel Islands National Park are in close proximity. Free Wireless High Speed Internet Access in All Guest Rooms.